What do you have in common with West Point graduates, NFL players, and Fortune 500 CEOs? You too can learn effective leadership principles from two New York Times bestselling authors. John C. Maxwell will eloquently guide you on a journey through the five levels of relationships, capped with eight ways you can win with people. Brian Tracy’s leadership audio program offers proven ideas and strategies for setting standards of performance in your organization. 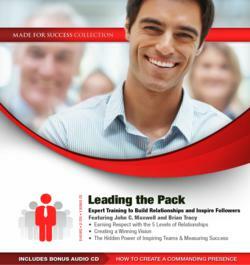 These programs have been used by major corporations, universities, and hundreds of the fastest growing businesses to inspire and train leaders on essential skills of leadership. Key takeaways include crafting an effective mission, creating relationships with teams, and earning respect within your organization. Develop your leadership effectiveness from the convenience of your car or while you work out with this powerful “must have” series of audios. BRIAN TRACY is the most listened to audio author on personal and business success in the world today. His fast-moving talks and seminars on leadership, sales, managerial effectiveness, and business strategy are loaded with powerful, proven ideas and strategies that people can immediately apply to get better results in every area.